Here is a selection of villas for sale. There are more but if you want more information please CONTACT US and we can discuss your requirements. Prices currently start at 250,000 euros for a villa and 150,000 for an apartment. Location Near the village of Fontana on a rural lane. Size Two properties, upper and lower. Upper completed and being rented out lower still in need of completion. The upper consists of 2 bedrooms, living room, kitchen, gardens and a pool. A great opportunity to buy a good rental property. The upper half of which is currently being rented out in the summer on a contract with a tour operator. Guide Price 630,000 euros to include furnishings, fixtures and fittings. 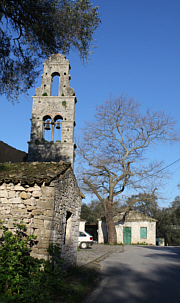 Location Situated above the village of Loggos in the area known as Koutsi. Short walk down the old military road to Loggos. Size 3 bedroom (84 sq m) villa with a mezzanine floor. Built in the mid 1990s. This is a single storey villa with a mezzanine floor set in the olive groves above Loggos and with partial sea views across to the Greek mainland. 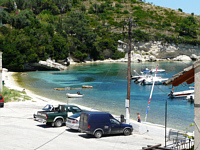 Location Just 50 metres from the waterfront in heart of the delightful village of Loggos. Size 1 bedroom, open plan kitchen/dining/living area, shower room and small sitting out area. This first floor apartment is in a prime position in the middle of Loggos and just a 10 – 15 minute walk from some of the best beaches on the island. Guide Price 160,000 euros to include many of the furnishings, fixtures and fittings. Location Above Marmari Beach near Loggos. This villa is in a lovely quiet rural location above Marmari Beach but within easy walking distance of Loggos and will have partial sea views across to the Greek mainland. It will have excellent rental potential and a contract with a tour operator will be available. Guide Price REDUCED: 420,000 euros fully furnished for letting. Guide Price REDUCED: 550,000 euros fully furnished for letting. Size Main building with large living room opening on to a large terrace, well equipped kitchen, bedroom and shower room with WC. Separate new building with air-conditioned bedroom with en suite bathroom and WC, storage room and boiler room. Garden with large terrace and sitting out areas. 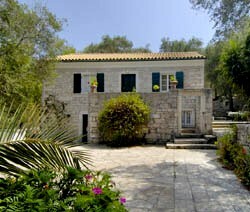 Description This villa is in a lovely quiet rural location in Kontoyanatika, above Kipiadi, Marmari and Kipos Beaches, and near Loggos. Guide Price 330,000 euros to include furniture, fixtures and fittings. Location Zernatika, between Loggos and Fontana. Size 3 twin/double bedrooms each with an en suite bath/shower room, 1 single bedroom, bathroom, open plan living/dining room, fully-fitted kitchen, landscaped gardens with numerous stone terraces, sitting out areas and a swimming pool. Description This traditional stone house, set in a lovely quiet rural location high above Loggos, has been beautifully restored to a very high standard. It has exceptional rental potential and is currently rented out through a tour operator. Guide Price Reduced to: 750,000 euros.